William Wordsworth in his Preface to Lyrical Ballads (1800), which was a kind of manifesto for Romantic poetry, complained that "The invaluable works of our elder writers, I had almost said the works of Shakespeare and Milton, are driven into neglect by frantic novels, sickly and stupid German Tragedies, and deluges of idle and extravagant stories in verse.  When I think upon this degrading thirst after outrageous stimulation, I am almost ashamed to have spoken of the feeble endeavour made in these volumes to counteract it". Wordsworth’s desire for plain language and his contempt for the Gothic, however, were contradicted by his colleague Coleridge’s focus upon the supernatural in poems such as "Rime of the Ancient Mariner", "Christabel" and "Kubla Khan; or, A Vision in a Dream". The major Romantic poets (even Wordsworth, in The Borderers) owed something to Ann Radcliffe, without whom we probably would not have Keats’s "Eve of St Agnes" and "Isabella" or Byron’s Manfred and other poems in which he creates the brooding "Byronic hero"  or indeed Edgar Allan Poe’s "The Raven". Such works are important specimens of the Gothic poetic tradition, but are too well known to need inclusion here. I have selected two almost unknown early works by the major poets: Coleridge’s "The Mad Monk", which when it was first published was described (presumably by an editor) as being written "in Mrs. Ratcliffe’s manner"; and Shelley’s "Song" and "Ballad", which were written a year or two before his Gothic novel St Irvyne (18089). According to his boyhood friend Medwin, "Such was the sort of poetry Shelley wrote at this period  and it is valuable, inasmuch as it served to shew the disposition and bent of his mind in 1808 and 1809, which ran on bandits, castles, ruined towers, wild mountains, storms and apparitions  the Terrific, which according to Burke is the great machinery of the Sublime." Two lines from Charlotte Smith’s The Emigrants (a political poem about the persecution following the French Revolution that forced the French clergy to flee to England)  "by the blunted light / That the dim moon thro’ painted casements lends"  were quoted by Ann Radcliffe in The Mysteries of Udolpho, and are believed to have suggested to Keats the "Charm’d magic casements, opening on the foam / Of perilous seas, in faery lands forlorn" which are used to symbolize the romantic imagination in his "Ode to a Nightingale". Keats pretended that any similarity of his work to Gothic literature was superficial: "In my next Packet as this is one by the way, I shall send you the Pot of Basil, St Agnes eve, and if I should have finished it a little thing call’d the 'eve of St Mark' you see what fine mother Radcliff names I have" (letter, 14 February 1819). But Coleridge, Byron and Shelley literally plagiarized passages from Radcliffe’s Mysteries of Udolpho. What we today refer to as the Romantics were known in their own time as the Lake School (referring to England’s Lake District where Wordsworth lived), though we have forgotten their minor members such as Lloyd, Lovell, and Allan Cunningham, and teachers tend to downplay how very many of their poems are concerned with ghosts, witches and fairies. For David Macbeth Moir, delivering lectures at the Edinburgh Philosophical Association in 1850/51, there were two main streams of poetry: the "Darwinian School" of artificial verse by Erasmus Darwin, Anna Seward, Hayley and the insipid Della Cruscans – versus the "Lewis School", i.e. the Romantics, "of which Matthew Gregory Lewis ought to be set down as the leader, and John Leyden, Walter Scott, Coleridge, Southey, James Hogg, Mrs Radcliffe, Anna Maria Porter, and Anne Bannerman, as the chief disciples." Perhaps it is just as well that today we have largely forgotten once-popular works such as James Montgomery’s "The Vigil of St. Mark" (1806) and Anne Bannerman’s "The Perjured Nun" (1802), but the poetry in this section, however "Gothic" and "minor", would have been seen as characteristic of the Romantic school by its contemporary readers. And Echo swells the chorus to the skies. For aught the huntsman’s puny craft supplies? Ah! no: he better knows great Nature’s charms to prize. But, lo! the sun appears! and heaven, earth, ocean, smile. When all in mist the world below was lost. Now scoop’d in gulfs, with mountains now emboss’d! Flocks, herds, and waterfalls, along the hoar profound! Fond of each gentle, and each dreadful scene. The southern sun diffused his dazzling shene. A sign, a tear, so sweet, he wish’d not to control. The visionary boy from shelter fly! And cool, and fresh, and fragrant, is the sky. The rainbow brightens to the setting sun! How vain the chace thine ardour has begun! ’Tis fled afar, ere half thy purposed race be run. But why should foresight thy fond heart alarm? Fancy and Hope too soon shall of themselves expire. Lingering and listening, wander’d down the vale. Or blast that shrieks by fits the shuddering isles along. A vision brought to his intranced sight. With instantaneous gleam, illumed the vault of Night. From whence no succour comes  or comes too late. Add dire increase of horrors  But alas! FAR be remov’d each painted scene! What is to me the sapphire sky? What is to me the earth’s soft dye? Or bid my heart be gay? And to her bosom strains the fancied sprite. Where floats, self-borne, the dense nocturnal air. And at thy magic touch congeal to stone. And let CREATION be a moment thine! The stranded bark, back to the waves resign! Mingle, and in the dreadful chorus flow! The frighted World receiv’d thy awful dower! Grandly terrific, paints thy birth. The Angels of his wrath bid fly! And fill’d, and rapt, each self-accusing soul! On THEE th’ Omnipotent bestow’d the hour! And mountains crumbled at thy yell. Thy native throne, amidst th’ eternal shades of HELL! And waves her Sceptre o’er the world below. Virtue’s sigh, and Sorrow’s moan! With shrieks of anguish  madness and despair! Yield to peace and mourning day! And all her train of visionary pow’rs. Queen of the solemn thought  mysterious Night! For all the scenes that Day’s bright eye pervades! And there upreared in points of frantic height. The mystic spell, that wakes the poet’s soul! And feeble thunders o’er these summits roll. Its recent fragrance on the air exhales. Then lead me ’mid thy slopes and woodland shade. Like the winged music o’er the folded rose. Thus shipped, in chace of moon-beams, gay they float. And in the grave of darkness leaves thee long. To the lone watch-dog’s bark! Answering a melancholy far sheep bell. Like thought recovered from an antique dream! The prolific essayist and critic Nathan Drake called Ann Radcliffe ‘the Shakespeare of Romance Writers’, for he felt that she ably carried on the native British ‘Celtic/Gothic’ tradition since the time of ‘Ossian’ and Shakespeare. Her novels inspired him to write several ‘Gothic tales’, such as ‘The Abbey of Clunedale’, ‘Montmorenci’, ‘Henry FitzOwen’, ‘Sir Egbert’ and ‘The Spectre’. His poem the ‘Ode to Superstition’, first published in July 1793 and subsequently revised, was designed to contain examples of ‘the two species of Gothic superstition, the terrible and the sportive’. His collected literary essays contain detailed criticism of the Gothic writings by Walpole, John Aikin and Mrs Barbauld, Reeve, Charlotte Smith, Radcliffe, Lewis, Beckford, and others now forgotten. That shook my trembling soul? The gloom of horror pours! And howling rend the air. And welcome then, suggesting pow’r! At evening close, or midnight hour. When a skeleton’s head was exposed! And shriek as he whirls her around. AN ODE, in Mrs. RATCLIFF’s manner. A chesnut spread its umbrage wide. In melody most like an old Sicilian song. Such motions as will never cease! Then wherefore must I know, that such a time has been? And thus that mournful voice its dreary plaint renew’d. The roof of ROSA’s grave. On which so oft we sate when ROSA was alive. I struck the wound  this hand of mine! Did never love like me. ’Tis not the blood of her I love. The sun torments me from his western bed! O let me lie in peace, and be for ever dead! Down thro’ the forest I pursu’d my way. The goat-herd’s tent upon the open lawn. That night there was no moon!! A major feature of both Gothic and Romantic poetry was the use of ‘German’ and ‘Old English’ folk tales and the recreation of the ancient ballad tradition. Tales of Terror and Tales of Wonder, to which Sir Walter Scott and well as Lewis contributed, were extremely popular. 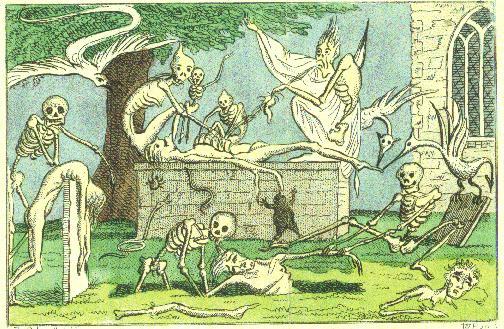 The Tales of Terror consist mostly of Spanish, Scottish, Swedish and Welsh ballads, many imitating and dedicated to M.G. Lewis, some attributed to him. It is worth listing the titles to illustrate the taste of the times: The Stranger; Hrim Thor, or the Winter-King; The Wolf-King, or Little Red-riding-hood; The Wanderer of the Wold; Gonzalvo; Albert of Werdendorff, or the Midnight Embrace; The Maid of Donalblayne; The Pilgrim of Valencia; The Grey Friar of Winton, or the Death of King Rufus; Grim, King of the Ghosts, or the Dance of Death; Osric and Ella; Martel, or the Conqueror’s Return; Ellen of Eglantine; The Black Canon of Elmham, or Saint Edmond’s Eve; The Scullion-Sprite, or the Garret-Goblin; The Troubadour, or Lady Alice’s Bower; The Sprite of the Glen; The House upon the Heath; The Mud-King, or Smedley’s Ghost; The Abbot of Leiston. Rather than include them here  like all folk songs, they are interminable  I have selected the prefatory remarks, in which Lewis defends the genre. FRIEND WHAT, scribble tales? Oh! cease to play the fool! And sense and nature reassume their sway. What gain, what pleasure, can your labours crown? A gossip’s story at a winter’s fire! And strive in vain a ghostly muse to kill? And lay her spirit in Oblivion’s tomb. Shall mar their purpose by too anxious haste. Till, swoll’n too big, they burst, and pass away. And, without feeling, scan the poet’s art. Nor heeds the gale by wavering fashion blown. In Britain with triumphant brightness blaze! From classic brightness turns to Gothic gloom. To wake Imagination’s darkest powers! Fill’d with rude scenes of Europe’s barbarous night! ‘Pomp, pride, and circumstance,’ of feudal times! Amid some lonely abbey’s ivied walls! And steep each feeling in romance’s streams! And burst tremendous on the wond’ring soul! Tales of Wonder: Written and collected by M. G. Lewis, Esq. M.P. Author of the Monk, Castle Spectre, Love of Gain, &c. 2 Vols. large 8vo. Pp. 480. 2l. 2s. Far from being inclined to join in the censure which has been directed against Mr. Lewis for compiling the present volumes, we think he is much better employed than in most of his former productions, at least, with reference to his well-known romance, entitled The Monk, a work that has tended more to vitiate juvenile minds, and poison the fountains of morality than any thing of the kind that has fallen within our notice for a long period. Indeed we hardly know of any work of so licentious a complexion, and of so mischievous a tendency, except the political crudities of the detestable Citizen PAINE. From all that we have read or heard of Mr. Lewis and his works, he seems to us to possess a singular turn of mind. His fancy appears to be chiefly attracted by, and absorbed in, the terrible, the horrible, the hideous, and the impossible; nor can we conceive what has been his bent of education that has led him into so uncommon a track of study. He certainly does not want abilities, or knowledge, but his talents are strangely perverted, and he sometimes seems even to be employed in throwing a ridicule upon himself. But to the present work. It consists of as many tales as the author could collect in order to scare the minds of children, and impress a terror upon the imagination through life. Some indeed of the compositions, to be found in these volumes, are of a pathetic, interesting, and moral cast; but they bear a small proportion to the works of the other tendency. Several pieces were written by Mr. Lewis himself, and others are well known. We shall extract an imitation from the German, by WALTER SCOTT, as a specimen of the works which these volumes contain, as he seems to be the best of the new species of horror-breeding Bards. Nought was seen save the lightning which danced in the sky. And low chilling murmurs the blast wasted by. She swiftly advanced to my lonely abode. As he sits in his lonely cell. To resolve Rosa’s form to its clay. And he strove to suppress them in vain. Tears again begun to flow. Which else must ever remain. And he shuddered to sleep with the dead. As he search’d for the new-made tomb. And enhorror’d he onward pass’d. And in horror sank on the ground. And he burst Rosa’s coffin asunder. And louder peal’d the thunder. Which dripp’d with the chill dew of hell. A deep groan was answer’d from Hell! ‘Why looks my lord so deadly pale? ‘Why heaves thy breast?  why throbs thy heart? That late with keenest lustre glow’d. E’en to the torture of my soul. To morrow I shall be no more! ‘But, O my Gertrude! dearest wife! Thy blood by Herman shall be drain’d! And Herman’s body shall be cold! The object whom her soul ador’d. The shade of Sigismund!  sad sight! Beheld aghast th’ enlight’ning glare. Distent, and fill’d with human gore! She shriek’d aloud;  then swoon’d away! From pests like these ere ‘twas too late. Still warm as life, and undecay’d. Deep in the earth, a sharpen’d stake! Both quiet keep the slumb’ring tomb.